Bible References: Exodus chapters 25, 35-38. Acacia wood was the only wood used to build the Tabernacle. Gold covered acacia posts and cross bars stabilized the acacia wood panels and held Tent of Meeting curtains in place. In the Tent of Meeting, the Table of the Presence (Showbread), the Altar of Incense (Golden Altar), and the Ark of the Covenant were built from acacia wood then overlaid with gold. Gold covered acacia poles were placed in gold rings on the four corners of each piece of furniture. When Israelites moved camp, poles were used to lift and carry structures and furniture. In the Tabernacle Courtyard, the Altar of Burnt Offering (Bronze Altar) was built from acacia wood, then overlaid with bronze. Bronze-cast rings were placed half-way up the Bronze Altar at each corner. Bronze-covered acacia wood poles were inserted into the rings to carry the Bronze Altar. The Courtyard was rectangular (approximately 150 by 75 feet). Unlike the Tent of Meeting, no acacia wood panels or boards were used to construct Courtyard sides. Sides were made of linen; however, the linen curtains were attached to acacia wood posts (top and sides) with silver hooks. When Israelites traveled from one camp to another, the Tent of Meeting and Tabernacle were deconstructed, then moved. God didn’t permit sacred furnishings and the Tent of Meeting to be transported on wagons or carts. He required that they be carried on shoulders of Levites. Acacia wood is beautiful, light, and practical indestructible. It was ideal for the multiple moves that Israelites made prior to entering Canaan. The Bible identified the wood used in the Tabernacle as shittah, which translates as acacia. The genus and species of acacia tree used in the Tabernacle can’t be established with 100% accuracy. Over the years, several acacia trees were suggested as the wood source. In the early twentieth century, scholars suggested acacia wood was from the Mimosa nilatica. Supposedly, Israelites brought this wood out of Egypt. Another scholar proposed that the Tabernacle acacia wood was from the Acacia tortillis, which grew in the Judean and eastern Negev Deserts. Jewish rabbinic writings asserted that acacia trees were cut by the patriarch Jacob and acacia wood taken into Egypt.8 During their approximately 450-year captivity, Israelites retained the acacia wood and left Egypt with it. Thus, when Moses asked for offerings to build the Tabernacle, Israelites offered their acacia wood. Although Mimosa nilatica and Acacia tortillis could have been sources of acacia wood used in Tabernacle construction, many scholars favor the Acacia seyal tree. The A. seyal is indigenous to the dry desert-like climate of southern Sinai. It grows in stony soil at the base of hills. The A. seyal can grow at altitudes from 65–7000 feet and with annual precipitations as low as three-and-one-half to nine inches. The A. seyal tree grows up to thirty-feet tall and has a broad somewhat flat canopy. Despite A. seyal plentiful presence on the Saini Peninsula, the tree had a drawback: The acacia tree has a pair of straight, light gray thorns at the base of each leaf. When Israelites cut down trees and fashioned boards (planks) for the Tent of Meeting and furniture they had to contend with these sharp projections. Further, when poles were created to carry the Tabernacle and courtyard furniture, sharp thorns had to be removed from poles. The acacia wood used in the Tabernacle symbolizes the humanity of Jesus, while the gold overlay of the boards and poles symbolizes Jesus’s deity. Isaiah described the Redeemer as a “a root out of dry growth” similar to the acacia tree growing out of arid desert soil (Isaiah 53.2 NIV). As Christians, we know that Jesus was fully human. It was in his human strength that Jesus endured unbelievable torture and death on the cross. Acacia wood is virtually indestructible, but, Jesus is fully indestructible. In his human body, Jesus died once for all people—those present on the earth when he lived and individuals of all future times. The indestructible Jesus rose after death and now sits at God’s right hand in heaven. Burnt offerings on bronze-covered acacia wood altars are no longer needed for sins to be forgiven and for man to be reconciled to God. Jesus’s death and resurrection invites each of us to become a child of God. Christians “are God’s workmanship, created in Christ Jesus to do good works, which God prepared in advance for us to do” (Ephesians 1.10 NIV). Part of our work on earth is to be like acacia wood—virtually indestructible—as we walk out God’s plans for our lives. God could have supplied trees without thorns for the Israelites to make boards for Tabernacle structures. Why did God have Israelites use a tree with thorns? One answer is that thorns on the acacia tree were to assist Israelites to realize that just because they were out of Egypt didn’t mean that all would be smooth in their lives. Their new world plants had thorns and projections that could/would pierce and puncture their skin. Similar to Israelites on Sinai, Christian believers in the twenty-first century need to work with what is available in their world. In the Sinai, an acacia tree was available. In a world filled with diverse individuals, social media, and twenty-four-hour news television, Christians find thorns. At times thorns are other persons. Some days, I think that there are more thorns than flowers in my environment. Nonetheless God put me in this life to live and interact with what and who is in my environment. All of these interactions are designed to be for his glory. Reflection: What are some items, events, people in your life that you need to learn to work with rather than avoid? Some people just have so many thorns (and, of course, I don’t)! How does learning to interact with thorny people enhance your spiritual life? Read how Tabernacle Curtains were made and used in Exodus 26:1–6 and 31-37; Exodus 27:9–19; and Exodus chapter 28. Flax was used extensively in the Tabernacle to make linen. Flax is native to the eastern Mediterranean region and was an important crop in Egypt since the 5th millennium B.C. The linen curtains, the blue, purple and scarlet embroidery yarn, and the linen priest’s clothes came from the flax plant. The two craftsmen, Bezalel and Oholiab, God designated to oversee building of the Tabernacle were given skill as designers and embroiderers in blue, purple and scarlet yarn and in fine linen (Exodus 35:35). In the Tent of Meeting, a curtain (veil) made of fine woven linen hung between the Holies of Holy and the Most Holy of Holies. Cherubim were embroidered on the veil with blue, purple and scarlet yarn. The Tent of Meeting roof was made of linen curtains. The curtains draped over the outside of the gold-covered acacia wood panels. Cherubim made of purple, blue and scarlet yarn were woven or worked into the linen curtains. A fine linen curtain covered the entrance of the Tent of Meeting (east side). The entrance curtain included colored yarn, however, there were no cherubim on the curtain. The sides of the Tabernacle courtyard were plain linen curtains held in place by silver hooks that attached them to the wood posts. The curtain at the courtyard entrance was the only courtyard curtain that included colored yarn. An embroiderer was used to make the entrance curtain. Aaron was the first Israelite high priest. God gave very specific instructions for making his clothes. The clothes included the breastplate, ephod, robe, tunic, turban, sash, and undergarments. All were made with fine linen. With the exception of the tunic and undergarments, all linen clothes were embroidered with or used colored yarn. No sandals or shoes were included as part of the high priest’s clothing. The rationale for lack of sandals was that when Aaron ministered to the Lord he was on holy ground. As priests, Aaron’s sons had special clothes. Their clothes included tunics, sashes, headbands, and undergarments made of linen; no colored yarn or embroidery was used. In the Bible, the Hebrew word for the linen associated with the Tabernacle is shêsh. Shêsh means “fine linen” and denotes a type of Egyptian linen of peculiar whiteness and fineness. When Egyptians wove fine linen, they used as many as 140 strands of threads per inch lengthwise (warf) and 64 strands per inch horizontal (weft). Linen of this fine weave had the appearance of silk. In ancient times fine linen was a mark of quality and associated with wealth and rank. Fine linen was the usual dress of Egyptian priests and royalty. Pharaoh dressed Joseph in fine linen when Joseph was promoted to second-in command over all Egypt (Genesis 41:41–43). Egyptian fine linen was exquisite – it was soft and flexible but strong, cool to wear, and had a luster or sheen to its whiteness. As slaves in Egypt, the Israelites would not have possessed much, if any, fine linen; however, when they left Egypt, the Egyptians gave them tribute. The tribute included clothes and more than likely included fine linen and yarn for spinning linen (Exodus 12:35-36). When Moses asked the Israelites for offerings to build the Tabernacle, he specified the need for blue, purple, and scarlet yarn and fine linen (Exodus 25:3). Exodus recorded that skilled women spun fine linen and blue, purple and scarlet yarn and brought these as offerings for the Tabernacle (Exodus 35:25-26). There is no record that women wove the yarn into linen cloth for curtains or priest’s clothes. The Ancient Egyptian flax plant, Linum usitatissimum, was used to make linen. In Biblical times flax was the most important fiber crop. Probably the L. usitatissimum originated in Mesopotamia; however, it was extensively cultivated in Egypt and less so in Palestine. In Egypt flax grew along the sides the Nile River and particularly in the Nile Delta region. In Egypt and the Middle East, flax was planted in the early winter and flax harvested in the spring. The flax plant has a single stem that grows up to four feet tall. The fiber is in the stem. Initially, the stem is green, but turns yellow as the plant ripens and readies for harvest. When flax plants were harvested for fiber, mature plants were pulled up by their roots. Harvested plants were allowed to dry, then retted. Retting is a process of soaking flax to separate the fiber from the woody tissue (straw). Egyptians dyed some flax threads. Blue and purple dyes were derived from shellfish (primarily the murex) which lived in the Mediterranean Sea. Scarlet dye came from the eggs and carcasses of a worm (Coccus ilicus) which lived on the leaves of holly plants. In ancient times, linen symbolized purity and in Revelation (15:5-6) St. John used “clean, shining linen” as a symbol for purity. Purity means spotless, stainless, free from what pollutes; containing nothing that does not properly belong; free from moral fault or guilt. The Hebrew verb for purify, tāhēr, also means to cleanse or to be clean. The Tabernacle complex with its linen curtains was a symbol of the Israelite’s need to be clean or pure before God. In the Tabernacle animals were sacrificed and animal blood shed to accomplish ritual purification. Today when individuals accept Christ as their Savior, they are purified (cleansed) or made spotless in relation to former sins. Then, the challenge of living a pure life begins. Of the 33 verses in the New International Version Study Bible (2002) which referred to purity, about 1/3 centered on the individual’s heart In the Old Testament, King David implored God to “create in me a pure heart” (Psalm 51:10). King David questioned who can approach God and stand before him? The answer was “He who has clean hands and a pure heart, who does not lift up his soul to an idol or swear by what is false” (Psalm 24:3–4). In the New Testament there is a similar focus on Christians keeping their heart pure. Christ taught, “Blessed are the pure in heart for they will see God” (Matthew 5:8). Paul told Timothy that love (the greatest of all virtues) comes from a pure heart, a good conscience, and a sincere faith (1Timothy 1:5). He instructed Timothy to “Flee the evil desires of youth, and pursue righteousness, faith, love and peace, along with those who call on the Lord out of a pure heart” (2 Timothy 2:22). Paul cautioned Timothy to have nothing to do with foolish and stupid arguments, because they produce quarrels (verse 23). Taken together, these verses from the Old and New Testament communicated that to please God, Christians must keep their hearts pure. Keeping a pure hearts begins with a sincere faith in Christ as our Savior. Purity means that we love one another and are free from moral guilt about how we act toward and think about each other. Purity is about actively pursuing faith, love, and peace. In addition to positive actions that help us to grow toward purity, the Bible verses on a pure heart articulated certain behaviors to avoid. These behaviors are worshipping idols, lying, becoming involved in nonproductive arguments and quarrels, and pursuing evil desires of youth, e.g., sexual debauchery. I want to keep my heart pure; however, sometime I do not restrain my impulses. At times I fill my life with irreverent thoughts and actions. In the past I often made my career an idol rather than keeping God at the center of my life. Most certainly I have engaged in foolish and stupid arguments, rationalizing them in the name of “devil’s advocate” or “intellectual debate.” How, then, can I keep a clean, pure heart so I can see God in my day-to-day life? The answer for me is the same as it was for the Israelites. I must agree with God about my sins. When I do, I can be at-one with God. God has made it easy for me to reconcile myself to him and his purity. I John 1:9 says if we confess our sins, God will cleanse us from sin and purify us from our unrighteousness. Having a pure, clean heart is as simple as going to God admitting my sin and asking His forgiveness. Reflection. When did you last clean up or purify your life? Would now be a good time to enact I John 1:9 in your relationship with Christ? The wooden structure of the Tabernacle is described primarily in Exodus chapter 25:1–27:19; Exodus 30:1–6; and chapters 35-38. Acacia wood was the only type of wood used in the construction of the Tent of Meeting, the sides of the courtyard, and the furniture and altars in the Tabernacle. The Tent of Meeting itself was constructed of gold covered acacia wood panels, or boards. Gold covered acacia wood posts and cross bars stabilized the acacia wood panels and held the Tent of Meeting curtains in place. In the Tent of Meeting, the Table of the Presence (Showbread), the Altar of Incense (Golden Altar), and the Ark of the Covenant were built from acacia wood then overlaid with gold. Gold covered acacia wood poles were placed in gold rings on the four corners of each structure. When the Israelites moved, poles were used to lift and carry each piece of furniture. In the courtyard, the Altar of Burnt Offering (Bronze Altar) was built from acacia wood overlaid with bronze. Bronze-cast rings were placed half way up the Bronze Altar at the four corners. Bronze-covered acacia wood poles were inserted into the rings for carrying the Bronze Altar. The courtyard was rectangular — approximately 150 feet on the north and south sides and 75 feet on the east and west sides. Unlike the Tent of Meeting, no acacia wood panels or boards were used to construct the sides of the courtyard. The sides were made of linen; however, the linen curtains were attached to acacia wood posts (top and sides) with silver hooks. When the Israelites moved from one camp to another, the Tent of Meeting and Tabernacle were deconstructed then moved (Numbers chapter 4). God would not allow the sacred furnishings and the Tent of Meeting to be transported in wagons or carts. He required that they be carried on the shoulders of the Levites. Acacia wood is beautiful, light, and practical indestructible. It was ideal for the multiple moves that the Israelites made in their years of journeying on the Sinai Peninsula and final march into Canaan. The Bible identified the wood used in the Tabernacle as shittâh which translates as acacia. The Genus and species of the acacia tree used in the Tabernacle cannot be established with 100% accuracy. Over the years, several trees were suggested as the source of the wood. In the early 20th century, scholars suggested the wood was from the Mimosa nilatica (Spina AEgyptiaca of the Egyptians) primarily because the Israelites could have brought this wood out of Egypt. Others proposed that the acacia wood of the Tabernacle was from the Acacia tortillis which grew in the Judean Desert and eastern Negev Desert. Jewish rabbinic writings asserted that acacia trees without any knots or fissures were cut by the patriarch Jacob at Migdal Ẓebo’aya, Canaan and taken into Egypt. During their captivity, the Israelites retained the acacia wood and left Egypt with the wood. Thus, when Moses asked for offerings to build the Tabernacle, everyone who had acacia wood offered it. Although Mimosa nilatica and Acacia tortollis could have been the wood used in Tabernacle construction, many scholars favor the Acacia seyal tree. The A. seyal is indigenous to the dry desert-like climate of southern Sinai. It grows in stony alluvial soil at the base of hills. The A. seyal can grow at altitudes from 65 – 7000 feet and with annual precipitations as low as 3.5 – 9 inches. The Acacia seyal tree is a semi-evergreen tree that grows from 20 – 30 feet tall and has a broad somewhat flat canopy. Acacia trees and acacia wood has taken on meaning beyond a common wood used in construction. The acacia wood used as the foundation of the Tabernacle symbolizes the humanity of Christ while the gold overlay of the boards and poles symbolizes Christ’s deity. Isaiah described Christ as “a root out of dry growth” similar to the acacia tree growing out of arid desert soil (Isaiah 53:2). As Christians, it is important to remember that Christ was fully human and it was in His human strength that He endured unbelievable torture and finally death on the cross (John 18 and 19). Acacia wood is virtually indestructible, but Christ is fully indestructible. In His human body, Christ died once for all people — those present on the earth when he lived and for individuals of all future times (Hebrews 9:12-14). The indestructible Christ rose after death and now sits at the right hand of God in heaven (Hebrew 10:12). Burnt offerings on bronze-covered acacia wood altars are no longer needed for sins to be forgiven and for man to be reconciled to God (Hebrew 10:11-18). Christ’s death and resurrection invites each of us to become a child of God. The builders and craftsmen of the Tabernacle worked with care and diligence to build the Tabernacle as God directed. As Christians “we are God’s workmanship, created in Christ Jesus to do good works, which God prepared in advance for us to do” (Ephesians 1:10). We are called by God and ordained for His work here on earth. Sometimes it isn’t easy to know the specific work God wants us to do. In the past I have been way off track with God’s plans for me. Alternatively, at other times I have been on track, walking as God ordained. Part of our work here on earth is to be like acacia wood – virtually indestructible –as we walk out God’s plans for our lives. How indestructible we are depends on how much effort we make to stay close to Christ. The best ways to stay close to Christ are by regular — preferably daily – Bible reading, prayer, and meditation on the Holy Scriptures. Reflection. Wouldn’t you like your epitaph to read:____________(your name) was indestructible in his/her walk with Christ. How can you make this happen? Copyright May 8, 2016, Carolyn A. Roth; all rights reserved. The fruit of the olive tree is identified three places in the Tabernacle which was built while the Israelites were camped at Mount Sinai. In all three places, it was olive oil, pressed from olives, which was used. First, olive oil provided fuel for seven lamps which set on the golden Lampstand in the Tent of Meeting, Holy of Holies (Exodus 40:1 – 5). One lamp set on each of the seven branches of the Lampstand. The Bible does not identify the material used in the construction of the seven lamps. Some authors identified the material as gold – the same substance used in the crafting of the Lampstand. Other authors suggested that the material was a type of clay used in pottery. Small pottery lamps were found at ancient Israeli archeological sites around the time of the Exodus. The lamps were open rimmed in contrast to later New Testament lamps which had a central hole into which olive oil was poured and a short spout which contained the lamp wick. In the open bowl-type lamp, one side was pinched narrow into a spout like protrusion. The wick extended from the spout side of the lamp. God told Moses to have the Israelites bring clear oil of pressed olives for the Lampstand lamps (Exodus 27:20-21). The high priest, Aaron, was to tend the lamps so that they burned continually before the Lord from evening until morning. The second place that olives were used in the Tabernacle was in the Bread of the Presence. The Presence Bread (Showbread) was a type of grain offering. God described meticulously that all grain offerings (Leviticus 2:1 – 16) should be prepared/offered with olive oil. The third place that olive oil was used in the Tabernacle was as an ingredient of the anointing oil (Exodus 30: 22-32). God decreed that Moses use anointing oil to anoint and consecrate (to God) every part of the tabernacle, the priests, and the priest’s clothes. 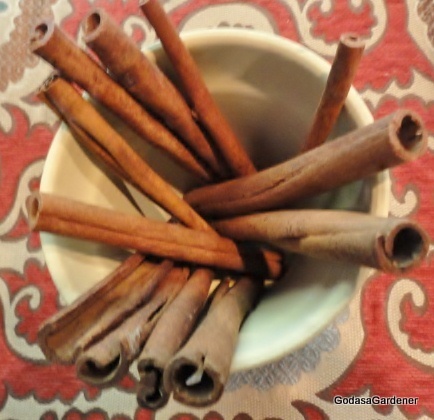 The anointing oil, described in detail, consisted of fine spices and a hin (3.7 liters or 1.5 gallons) of olive oil. The anointing oil was to be God’s sacred anointing oil for future generations. If anyone made perfume using the same formula and put it on other than a priest, he/she was to be cut off from the Children of Israel. 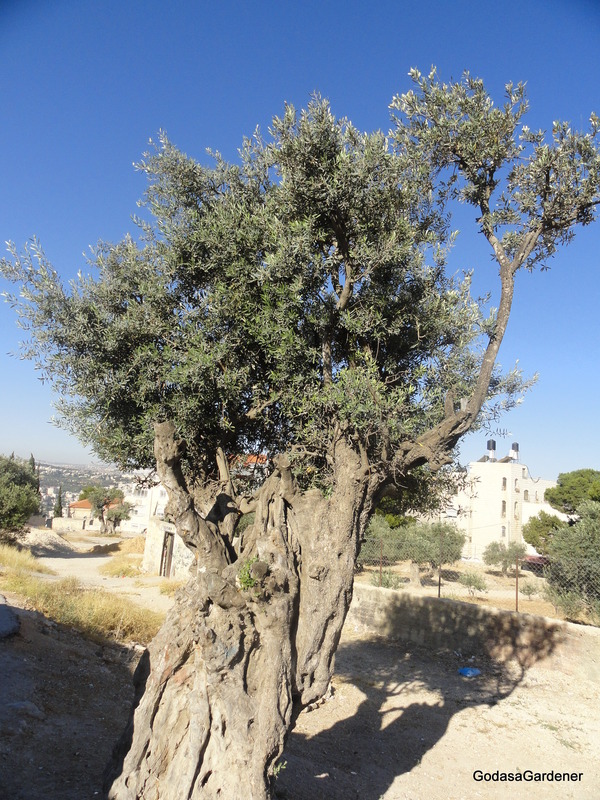 The olive tree is the second plant mentioned in the Bible and one of the world’s oldest cultivated trees. Archeological evidence suggests that the olive tree was first domesticated in the 4th millennium B.C. The wild Mediterranean olive is the most likely progenitor of today’s cultivated olive, Olea europaea. Some scholars identify the olive as indigenous to present day Israel and Syria; while others claim North Africa or Crete as homes of the first olive trees. In all probability there were wild olive trees growing in the Sinai Peninsula when the Children of Israel traveled there in 1446 – 1406 B.C. Olive trees are long lived, up to 1000 years. They are evergreens that grow to a height of 65 feet with spreading branches that form a dense crown or canopy. In Old Testament times, youth used long sticks to shake olive tree branches with the result that ripe olives fell to the ground. To obtain small quantities of clear olive oil such as used in anointing oil, olives were gently squeezed — so that no parts were crushed. When we think of the symbolism of the olive tree, we associate the olive branch or leaf as symbols of peace and prosperity. This symbolism comes from the Greeks where the olive tree was the sacred tree of goddess Athena. Athens, the capital of Greece, took its name from the goddess. In the Old Testament olive trees, branches and olives are not associated with peace or prosperity. In Exodus and Leviticus, the Hebrew word for olive tree, olive, and olive oil is zayith; zayith means an olive, as yielding illuminating oil. Another Old Testament word for olive is sheman, meaning to shine or anoint. The writers of the Old Testament Psalms repeatedly told the Israelites then and Christian’s today that God is our light (Psalm 27:1,Psalm 89: 15, Psalm 119: 105). In the New Testament, Christ is described or describes himself as the light of the world and of men (John 1: 4, John 8:12, John 12:46). In the Old Testament, the Israelites were to reflect God’s light to the surrounding nations (Isaiah 42:6, Isaiah 49:6). Today, Christians are called to take Christ’s light into the world. Christ said “you are the light of the world…. let your light shine before men that they may see your good deeds and praise your Father in heaven” (Matthew 5: 14 – 16). St Paul wrote “you are light in the Lord. Live as children of light (for the fruit of light consists of all goodness, righteousness and truth)” (Ephesians 5: 8 – 9). One of the saddest stories in the Bible involves the lamps of the golden Lampstand (I Samuel 3: 1- 4). The Children of Israel are now in the Promised Land and the Ark of the Covenant and the golden Lampstand are at Shiloh. As the chief priest, Eli has the task of preparing and lighting the seven lamps each evening. The story is set early one morning before sunrise. Samuel recorded a small sentence, “The lamp of God had not yet gone out” (I Samuel 3:3). That the lamps burned low or burnt out before morning means that Eli did not prepare the lamps with sufficient olive oil or wick length so that the lamps would burn through the night until morning. The lack of illumination before the Table of the Presence symbolized spiritual dimness in the lives of priests and Israelites. Both were neglecting God; consequently, their lives were not filled with the light of His presence. In this same vignette, Samuel wrote “in those days the word of the Lord was rare; there were not many visions” (I Samuel 3:1). There could be no illumination (words or visions) from God when the priest and people were neglecting or disobeying Him. As olive oil lamps shined on the Presence Table in the Tent of Meeting, Christians are illuminated by Christ and they reflect Him in a dark world. If our light dims or burns out, how will Christ be seen? This little light of mine, I’m going to let it shine. This little light of mine, I’m going to let it shine. Let it shine, let it shine, let it shine. I’m not going to let Satan blow it out. I’m going to let it shine. I’m not going to let Satan blow it out. I’m going to let it shine. Let it shine, let it shine all over the world. Reflection. So what about you? Is you light burning for Christ, or has your light grown dim? Read about the Lampstand of the Tabernacle in Exodus 25. The almond tree symbolizes God’s watchfulness. The almond tree was central to the Tabernacle and is described in two key situations. First, almond tree buds, blossoms and flowers are the design on the Lampstand (Exodus 25:33-34). The Lampstand and it accessories were made of 75 pounds of gold (MacDonald, 2005). In the Bible, no dimensions (height, width of the top of the Lampstand) were given for the Lampstand; however, its base and arms are described in detail in Exodus 37: 17 – 23). Three branches extend from one side and three branches from the opposite side of the central base. 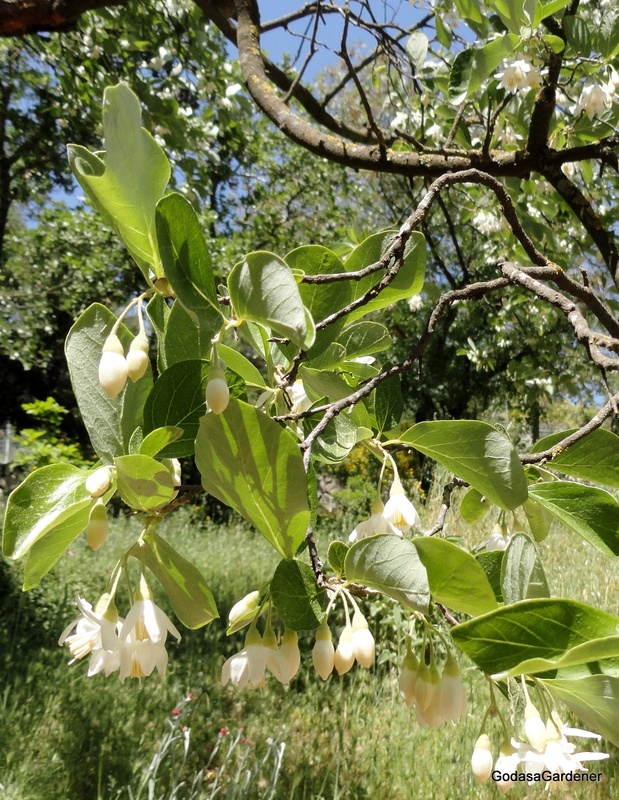 On each of the six branches there were three cups shaped like almond flowers with buds and blossoms. The Lampstand base and central branch had four cups shaped like almond flowers with buds and blossoms. One almond bud was under the first pair of branches, a second bud under the second pair of branches, and a third bud under the third pair of branches. The buds and seven branches were all one piece of gold with the base, hammered out of pure gold. At the top of each of the seven branches was set an oil lamp. The second source of almonds in the Tabernacle is Aaron’s staff which sprouted overnight while in front of the Ark of the Testimony (Covenant) in the Tent of Meeting (Numbers 17: 1 – 11). Unlike staffs representing the other 11 tribes of Israel, Aaron’s staff produced buds, blossoms and almonds. Aaron’s staff was not placed in the Tabernacle at its initial construction at Mt. Sinai. After Aaron’s staff sprouted it was kept in front of the Testimony in the Most Holy of Holies during the wanderings of the Israelites. Paul avers that that Aaron’s staff was placed in the Ark of the Testimony (Hebrews 9:4); however, Aaron’s staff was not in the Ark of the Testimony when Solomon brought the Ark to the first Temple in Jerusalem (I Kings 8: 9). The almond tree described in Exodus and Numbers is likely the Prunus amygdalus var. 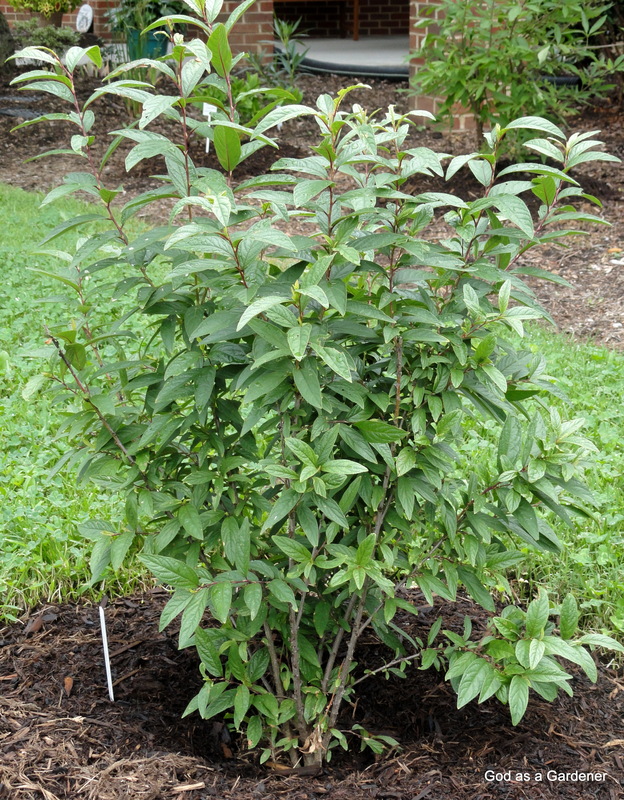 dulcis or Amygdalus (almond) communis(common). 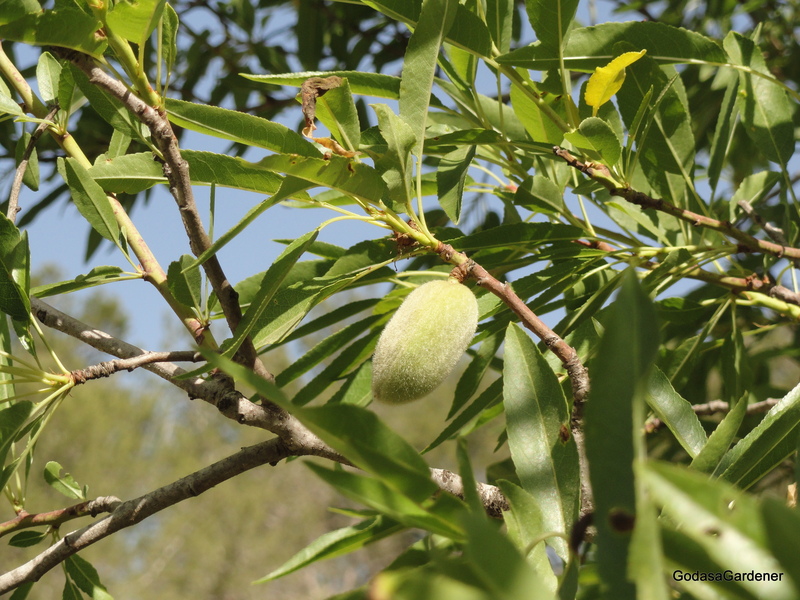 The almond tree bears sweet almonds which were used for food in the eastern Mediterranean region. Domesticated almonds were identified in the early Bronze Age (3000-2000 B.C.). Usually almond tree grow 12 – 27 feet in height. The flowering almond tree buds in Israel as early as February and is one of the most beautiful flowering trees in nature. In Old Testament times almonds were eaten raw or roasted, pressed for almond oil, and used to flavor porridge, breads and other baked goods. In Egypt, almonds were found in Pharaoh Tutankhamen’s tomb in Egypt (around 1327 B.C. ); these almonds were likely imported from Canaan. When Jacob directed his sons to go to Egypt to buy grain, he told them to take almonds as a gift to the Egyptians because almonds were “some of the best product of the land” (Genesis43:11). In the Hebrew language, name for almond tree is shâqêd (Strong, 2010). The primary root of shâqêd is shâqad which means to be watchful, alert, on the lookout, and sleepless. Almond buds and blossoms were placed on the Lampstand where the lamps burned during the night to symbolize two things: first, the constant watchfulness of God over His people and second the need for Israel to be alert to the commandments of God. The association between the almond tree and watchfulness of God over Israel is repeated in Jeremiah 1: 11 – 12. The Lord asked Jeremiah, What do you see? Jeremiah’s response is, “I see the branch of an almond tree.” God returns, “You have seen correctly, for I am watching to see that my word is fulfilled.” Job (7:20) calls God a “watcher of men.” Placing Aaron’s almond rod in the Most Holy of Holies is a reminder that the priesthood must be watchful against any rebellion or turning of the Children of Israel from God’s laws. By using the symbolism of the almond tree in the Tabernacle, God provided both reassurance and caution to the Children of Israel. He provides reassurance that He is always watching over them. At the same time God cautions His Children to remain alert to events and situations that can detract them from keeping God as the primary focus of their lives. At this time I am teaching an on-line course to university students. When courses are offered online, faculty and students rarely meet person-to-person. Students can be in Africa as missionaries, in Guam on a military ship, or anywhere across the globe. Faculty must be watchful that students read and implement the course syllabus, content, and assignments. If a student is off track, the faculty must immediately respond to assist her/him to re-read or re-think their work. Students ask questions of the faculty on line in Discussion Boards or via university email. University policy requires faculty to respond to students within 24 hours. At the same time students have a responsibility to be alert. They need to read posted announcements, grading comments, and answers to questions posed by classmates. If students are not constantly alert to the interactions in the course, they can limit their learning and their earned grades. Faculty-student interactions in an online course are a reflection of how God works with us. He constantly monitors our behavior and when we get off track, He sends us messages that we need to readjust our thinking and our behavior. Unlike my interaction with students, God does not take up to 24 hours to learn what I am thinking/doing and respond to me. He knows immediately. And, thanks be to God, He does not figuratively pull His hair out at some of the things I do or neglect to do. God is continually and constantly watchful over me. That does not mean that I can float along in my relationship with God and expect Him to do all of the work. I must stay alert and track with His guidelines for a successful life. In Matthew 26:40 Christ warns Peter, “watch and pray so that you will not fall into temptation. The spirit is willing, but the body is weak.” Paul instructs Timothy to “watch your life and doctrine closely. Persevere in them, because if you do, you will save both yourself and your hearers” (I Timothy 4:16). Reflection: Are you being watchful of your life and behavior so you do not drift from closeness with God? Are you watching and praying so you do not fall into temptation? Copyright: Carolyn A. Roth, January 15, 2014. All rights reserved.